Searching for some inspirational letting go quotes and sayings i.e. quotes on letting your love or something very special go. If yes, here I have compiled down some of the inspirational and motivating quotes on letting go. Just hope you will like the quote compilation and feel inspired after going through it. It's me. I chose this. I chose all of this — this rock has been waiting for me my entire life. I’ve been moving towards it my whole life. The best skill at cards is knowing when to discard. You should get out of here. Have a good life. Don't go through life; grow through life. My tears will show that i can let you go. I keep thinking about this river somewhere, with the water moving really fast. And these two people in the water, trying to hold onto each other, holding on as hard as they can, but in the end it’s just too much. The current’s too strong. They’ve got to let go, drift apart. Get it? Got it? Good, I'm gone. What happens when you let go, when your strength leaves you and you sink into darkness, when there's nothing that you or anyone else can do, no matter how desperate you are, no matter how you try? Perhaps it's then, when you have neither pride nor power, that you are saved, brought to an unimaginably great reward. It's the way you fall you. Gotta let yourself go. Today expect something good to happen to you no matter what occurred yesterday. Realize the past no longer holds you captive. It can only continue to hurt you if you hold on to it. 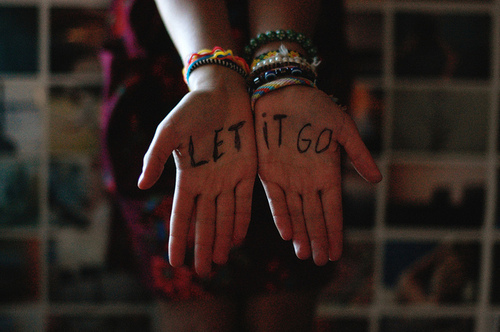 Let the past go. A simply abundant world awaits. Let go of certainty. The opposite isn't uncertainty. It's openness, curiosity and a willingness to embrace paradox, rather than choose up sides. The ultimate challenge is to accept ourselves exactly as we are, but never stop trying to learn and grow. Life has its rhythm ad we have ours. They’re designed to coexist in harmony, so that when we do what is ours to do and otherwise let life be, we garner acceptance and serenity.